Height: 153 mm / 6"
Diameter: 93 mm / 3½"
"It takes beer to make thirst worthwhile." This German proverb is best understood when enjoying beer from a highly functional and visually appealing glass such as Stölzle's Beer Goblet. Of course, restaurant owners are aware of this fact and like to serve special brews in these Beer Goblets. 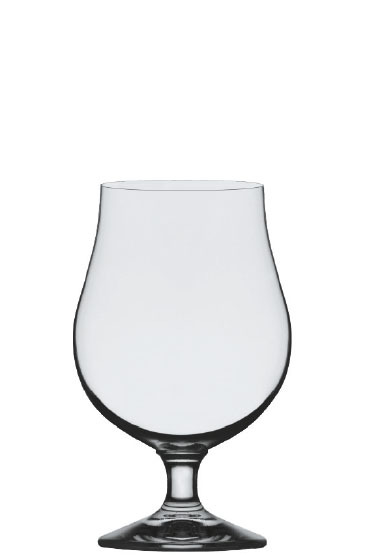 The beer glasses are mechanically manufactured from lead-free crystal glass and boast very exact glass distribution. The bowl of this beer glass sits on a short stem. This gives the goblet a low center of gravity, making the glass very stable. Despite its sturdiness, the Beer Tulip has a timeless and elegant air about it, exuding a sense of exclusivity. The Beer Goblet's bowl features a large diameter. This guarantees a delightful drinking experience, as the aromatic substances are concentrated in the glass. In beer, these aromatic substances are picked up by the nose and are very important due to their diversity. The beer glass tapers upwards. This presents the beer in the best possible way with a solid head.